If you are planning on coming out for a few days for skill instruction or guiding, take advantage of our frequent climber card. You'll not only learn the skills you need, but also have a yearly climbing membership for the Mohonk Preserve for more return trips that year. Purchase a Frequent Climber Card and save. You'll receive 6 private guided days for the price of 5, plus an annual climbing membership to the Mohonk Preserve for $1575 - a savings of $415. You'll receive 13 private guided days for the price of 10, plus an annual climbing membership to the Mohonk Preserve, for $3250.00 - a savings of $945. The Mohonk Preserve membership is valid for one year from date of purchase. 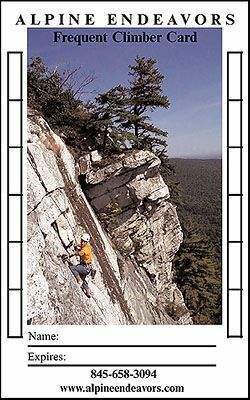 The frequent climber card is valid for one year from date of purchase, Sunday through Friday (no Saturdays), and is good for the Shawangunks*, Catskills, or Adirondacks** for rock or ice climbing. You can have a partner join you for a day for an additional fee. It offers a great value and provides you with the opportunity to learn skills throughout the season. * The Frequent Climber Card is not valid at Sky Top. Cancellations are subject to our cancellation policy.